There’s good weather and there’s bad weather. Then there’s also strange weather — events far outside of the normal but without clear human understanding of future ramifications. I’m not exactly sure in which realm we currently exist; however, there has been no lack of weather-related items in the news of late. 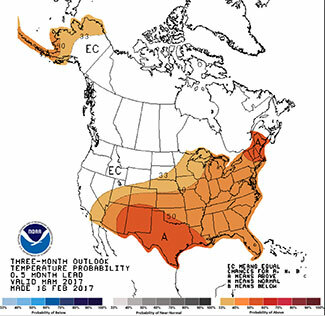 Virtually all regions of the U.S. have experienced stretches of unusually mild weather during February. The USA National Phenology Network tracks a number of factors that indicate spring has arrived or is imminent. Groundhogs are left in their holes. The scientists model historical observations of the timing of first leaf and bloom for indicator species such as lilac and honeysuckle, and use daily weather station observations to determine a general leaf-out date for a more broad range of plant species. 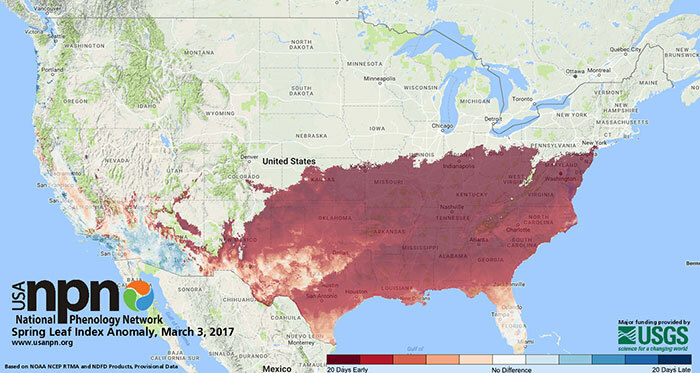 Based on their most recent map (below), areas in the Southeast and mid-South can expect the arrival of spring two to three weeks earlier than normal. So might many others. El Niño . . . again? Okay, let’s not go crazy, but El Niño is back in the news. It seems like just yesterday that we were in the midst of a strong El Niño event. According to National Weather Service’s Climate Prediction Center, the La Niña conditions we’ve most recently experienced are no longer present with slightly above average sea-surface temperatures across the eastern equatorial Pacific Ocean. The smart money and computer models have a neutral condition remaining through May. However, the September through November prediction now points to about a 50 percent chance of La Niña conditions developing. Further, when all the models are averaged, they favor a weak El Niño condition beginning in early summer with strengthening conditions during the autumn months. Looking at the Climate Prediction Center’s three-month outlook for temperature and precipitation, it projects a warm one for a good chunk of the United States. Beyond that, it’s a roll of the dice. Though we like to discuss and sometimes worry about future weather events, it’s always best to plan for the normal and be ready for the abnormal. 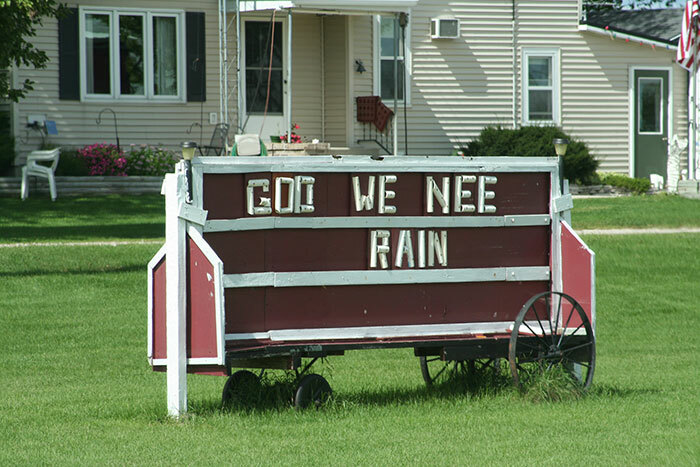 Let’s face it, most of our greatest weather nightmares never come to fruition. 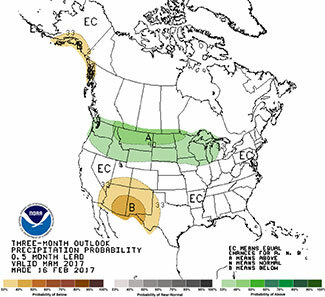 An early, warm spring looks to have a high probability, but that doesn’t mean planting a month ahead of what’s “normal” is a good idea. It only takes one cold night to create a replant situation. What we can anticipate is earlier insect pressure and more of them. Alfalfa weevils may appear earlier and be a bit more ferocious, but even that is difficult to predict as sometimes a warm March is followed by a cold April. Growing environment, particularly temperature, has a strong influence on both forage growth rate and quality. If the predictions for continued warmer than normal temperatures actually do play out, plant growth will be accelerated and forage quality will decline at a faster rate than during a typical spring. Accordingly, harvest timing will need to be adjusted or more pasture acres may need to be harvested for hay before quality declines to the level of cordwood. Let the growing season begin.